I love to make stuff and sometimes I even get paid! Patti Robinson is an artist and art teacher working with repurposed materials in many different forms, including collage, mixed media, fashion, sculpture, and design. She has a BFA in Art and Art History from Arcadia University. A major influence was her work archiving source materials for the estate of Joseph Cornell. She was selected as an Artist in Residence for healthcare training program through The Creative Center and the National Endowment for the Arts, the NYFA MARK program and the Teaching Artist BOCES Arts in Education Program. She has been teaching art and design to adults and children throughout Eastern Long Island and New York for the past ten years. 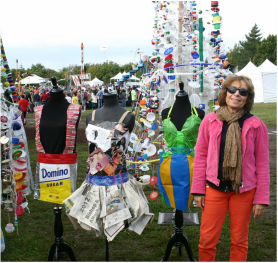 She created a collaborative recycled fashion workshop for hundreds of participants at World Maker Faire and received a blue ribbon. She was the creative director and an art instructor at The Art Farm, a children’s camp in Bridgehampton from 2007 - 2013. Her work has been featured in Cloth Paper Scissors magazine, Treehugger.com, Recylart.com and Makezine.com.